Brazilian stocks headed to the first weekly decline in a month as banks fell after policy makers doubled a tax on consumer loans to try to curb inflation. The Bovespa stock index fell 0.4 percent to 68,870 at 1:08 p.m. New York time. Fifty-six stocks declined on the index, while 13 advanced. The measure is down 0.8 percent this week, the first weekly drop since the period ended March 11. The real strengthened 0.6 percent to 1.5770 per U.S. dollar. The measure’s decline was limited as commodities rose for a seventh day on optimism for an economic recovery and on a weaker dollar. The Standard & Poor’s GSCI Spot Index of 24 raw- materials futures reached 753.89 points, the highest level since Aug. 4, 2008. Copper, a bellwether for global growth, rose for a fourth day to a one-month high in London. MMX Mineracao & Metalicos SA jumped. Starting today, consumer loans will be subject to a 3 percent annual tax, known as IOF, up from the previous rate of 1.5 percent, according to a Finance Ministry statement. Policy makers are adopting a blend of higher interest rates, measures to curb credit growth and budget cuts as they try to prevent inflation from breaching the 6.5 percent upper limit of their target range. In the interest-rate futures market, yields on contracts maturing in January 2012 fell 1 basis point, or 0.01 percentage point, to 12.24 percent. Santander Brasil slumped 2.7 percent to 18.83 reais. 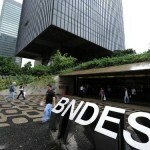 Banco Bradesco SA (BBDC4), Brazil’s second-biggest bank by market value, declined 2.3 percent to 32.38 reais. Rossi rose 1.2 percent to 15.03 reais. MMX gained 3.2 percent to 10.86 reais, rising to the highest intraday price since Jan. 21. Vale SA (VALE3) rose 0.1 percent to 47.47 reais. The world’s second-largest mining company offered to buy South African copper producer Metorex Ltd. for about 7.4 billion rand ($1.11 billion) as it seeks to boost output of the metal almost fivefold by 2015. Rio de Janeiro-based Vale will offer 7.35 rand a share, a 3.5 percent premium to the company´s closing price yesterday in Johannesburg, according to a statement today from Metorex. Shareholders owning about 25 percent of the Johannesburg-based company´s capital have agreed to the offer, according to Vale. CPFL Energia SA, Brazil’s largest private-sector power distributor, declined 0.8 percent to 44.86 reais. The company agreed to buy wind-energy producer Jantus SL for 950 million reais ($599 million). The deal includes four wind farms in the Brazilian state of Ceara, which have installed capacity of 210 megawatts, and wind projects set to add another 867 megawatts, Sao Paulo-based CPFL said yesterday in a regulatory filing. Cyrela Brazil Realty SA Empreendimentos e Participacoes (CYRE3), Brazil’s second-biggest homebuilder by revenue, gained 0.5 percent after dropping as much as 0.9 percent earlier. The company reported first-quarter preliminary contracted sales of 998.6 million reais, down 6.3 percent from a year earlier, according to a regulatory filing. “Overall, we regard Cyrela’s operating performance as weak, especially on the sales front, which paves the way for a uninspiring financial performance,” Banco Santander analysts including Flavio Queiroz said in a note to clients today. Cosan fell 2.7 percent to 23.80 reais. There are “increased governance risks” related to the lack of disclosure about the compensation minority shareholders will receive after Cosan creates a joint venture with Royal Dutch Shell Plc., analysts Fernando Ferreira and Isabella Simonato wrote in a note to clients today. Cosan is down 8.7 percent this week, the biggest weekly drop since May. Brazil may tax sugar exports in a bid to spur more ethanol production and lower prices, newspaper Valor Economico reported April 6, without saying where it got the information. The government is “discussing” ways to guarantee ethanol supply to consumers, Agriculture Minister Wagner Rossi told reporters in Brasilia April 6. Rossi declined to say whether taxing sugar exports is one of the measures under discussion. The Bovespa is down 0.2 percent this year through yesterday after declines in homebuilders and banks on concern inflation will limit growth overshadowed a rally in telecom shares. The index trades at 11.1 times analysts’ earnings estimates, according to weekly data compiled by Bloomberg. That compares to a ratio of 13.9 for the Shanghai Composite Index, 7.7 for Russia’s Micex, and 15.5 for India’s Sensex.